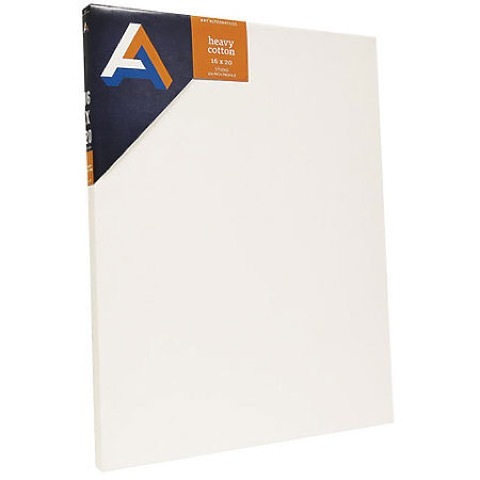 Constructed with heavy-duty, high-quality materials, Heavy Cotton Stretched Canvas is great for heavy paint and mixed media applications, palette knife work and pieces that are meant to last. It is suitable for use with all acrylic paints, oil paints and other wet or dry media. The unbleached 9 oz. cotton duck is primed with acid-free acrylic titanium gesso to a finished weight of 13 oz. and stretched around kiln-dried solid pine stretcher bars. Back-stapled with folded, uncut corners. Sizes with a dimension of 24" or longer are braced for additional support. Available in two profile depths: Studio canvases have a ¾" deep profile and Gallery canvases have a 1½" deep profile, providing additional strength and support, especially for larger sizes. Canvases to be shipped must be ordered in full case quantities and additional shipping charges may apply. Contact us for details.